I’ve been making mini raised beds. Little one foot wooden boxes without a top or bottom and 8″ tall. It is a little raised bed for the raised bed. Metal raised bed corners make for quick, easy assembly. Here’s how: cut four 2 x 8 x 12 wooden pieces. Cedar lasts longer, pine is cheaper. Scrap lumber makes me happy. I call it a Carrot Box because I made it to grow carrots. Loosen and add organic matter or compost to the raised bed. 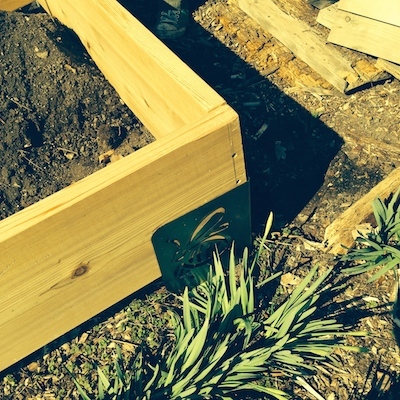 Set the box in your raised bed garden. Fill with a light soiless mix. Thinly sow carrot seed. Cover. Firm. Water. 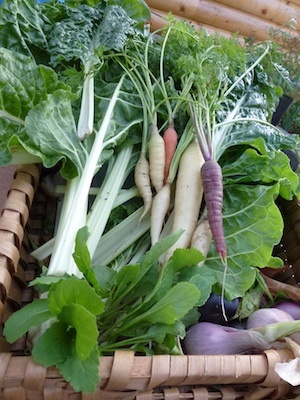 Details are on my hub page Grow carrots weeks ahead of the last frost. For the best results, thin the carrots to 2″ apart. Using a double-deep container with extra fine soil will be the key to growing carrots. It is critical that you fertilize and water carrots regularly. Rose Marie Nichols McGee at Nichols Garden Nursery has one of the best gardening blogs, The Gardener’s Pantry and newsletters. How can you make a soup rich? Add 14 carrots (carats) to it. I don’t know where the original recipe came from, but it is the best. Beat together oil, sugar and eggs until well combined. In a bowl sift flour, baking soda, salt, cinnamon and cloves. Add to the eggs and sugar. Mix well. Drain the pineapple, add carrots, nuts. Mix well. Pour into 9 or 10 inch tube pan or a 9 x 13 inch pan. Bake at 350 degrees for 1 hour or check with toothpick. Cream cheese and butter together. Add sugar gradually until complete box has been added. Add vanilla. Refrigerate for an hour, then frost cake. Use all frosting. 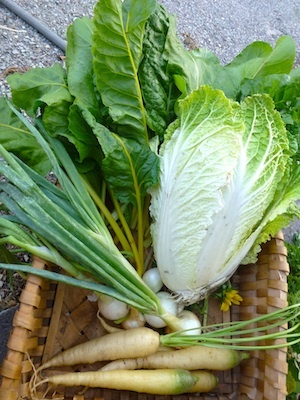 Today’s Harvest Basket, September 16, 2014. Bunnies are always hiding in my garden. Today, I also discovered carrots. I was planning a journal entry called “Garden Cleanup.” While I was tidying up the herb garden, I discovered these giant carrots. This is a new vegetable in my garden, it is only the second year to grow carrots. I was never inclined to grow carrots because I didn’t especially like them. Carrots was not a crop grown in Grandmother’s garden. Her Ozarks garden was red clay and very rocky, making it impossible to grow carrots. I had no idea where carrots came from. 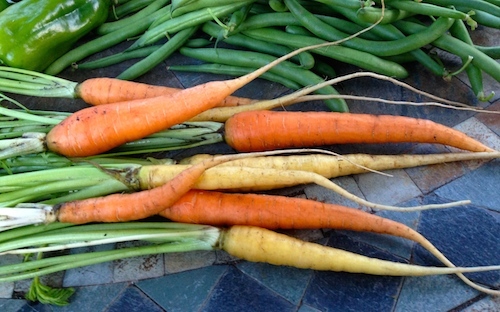 The 10″ long carrots were masquerading as it’s cousins: parsley, cilantro, and chervil. All of these herbs are members of the carrot family. The flowers look like Queen Ann’s Lace. Sitting behind the harvest basket are water-filled jars of parsley, cilantro, or chervil. The parsley will go into tabouleh. Cilantro will be frozen into a pesto-like condiment, ready to drop into bean dishes, chili, enchilada sauce or salsa. Chervil has only been in the garden for a couple of years. I will use chervil in potato dishes like potato salad. Finely chop all these herbs and mix together. Use fresh or store in the refrigerator in a zip lock or small air tight container for a couple of days. I have all these herbs growing in the garden now. Usually, chervil is available only in the cool season. I will mix fines herbes into an herb herb butter to freeze. Lacy chervil in part shade.